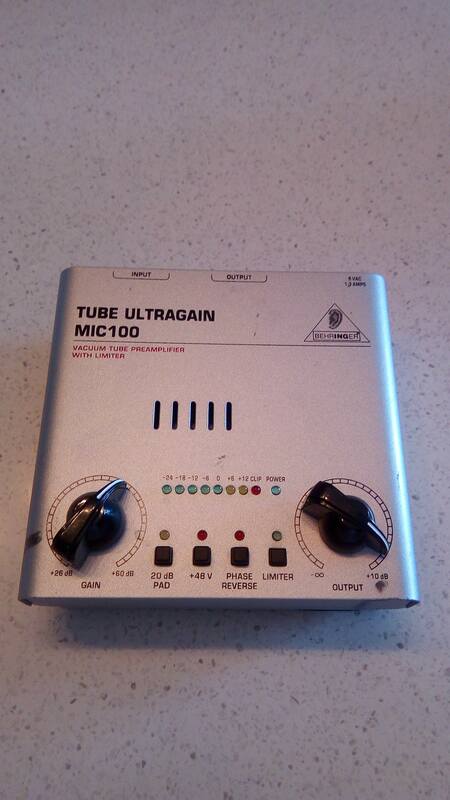 Tube Ultragain MIC100, Tube Pre-amp from Behringer in the Ultragain series. 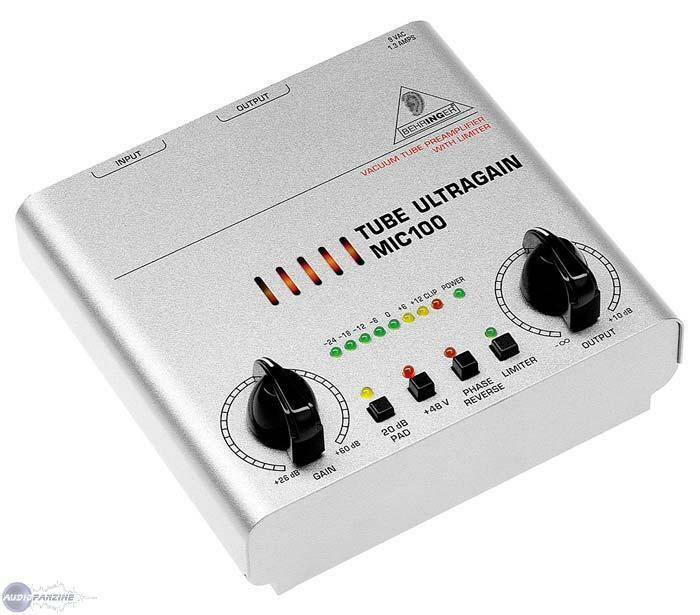 The TUBE ULTRAGAIN MIC100 is a vacuum tube mic/line preamplifier with integrated limiter for studio, live and hard disk recording applications. It features a carefully selected 12AX7 vacuum tube with UTC technology for warmth and lowest noise. Thus, the MIC100 can be used to eliminate the \"dull\" sound of standard digital recorders and sound cards. Also, it complements studio-grade condenser microphones. When used as a high-end DI-box, it ensures signal integrity. 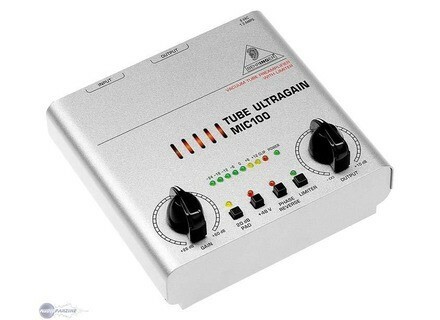 The TUBE ULTRAGAIN MIC100 comes with phase reverse switch, +48 V phantom power and 20 dB pad. Balanced inputs and outputs provide the finishing touch. 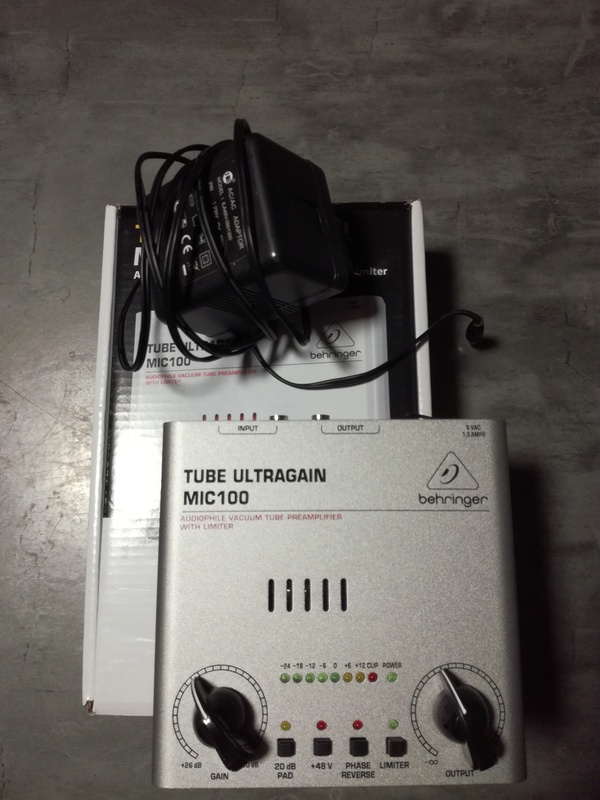 MGR/Billy's review"Behringer Tube Ultragain Mic100 Preamp and DI with Limiter"
This is a the table top model, not a pedal or is it a rack unit. It's about the size of a standard DI box or external hard drive. These run about $50. I picked it up to find out if it really does all it says it does for $50. You can get them just about anywhere that sells Behringer products. I like the the unit is cheap. It's lightweight. If it broke in 6 months I would not be heart broken nor angry. You get what you pay for. It will 'warm up' your signal with a little bit of tube warmth. 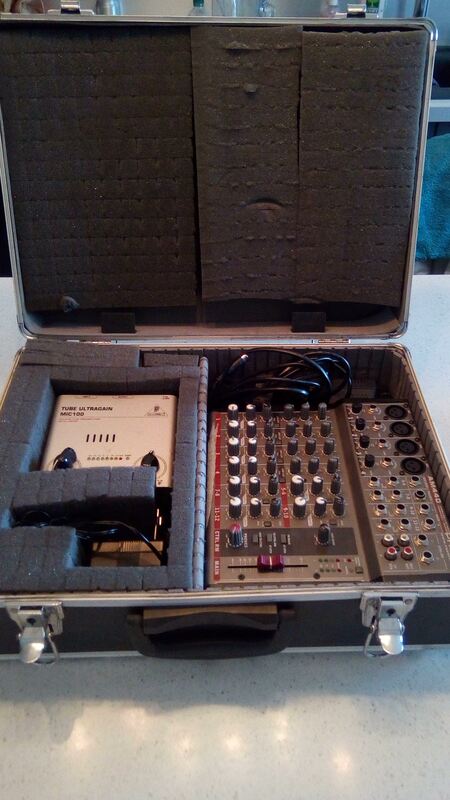 Sure it isn't going to sound AMAZING, but if you're on a budget it's a great unit. I like that it has an XLR input as well as an instrument input. I can use this for vocals or a guitar. The -20 DB is very helpful. Power is great. You can power it through Phanton Power, a power supply or by a 9 volt battery. The Limiter is very limiting. You can't adjust it other than your gain and output volume knobs. Since the unit is cheaper the construction is not on par with what I think it should be for a pro situation, but hey pros don't need to worry about budgets right? I mentioned before I do not think the construction is up to snuff. You will most likely set this on top of your amp and sooner or later an instrument cable with get tugged or stepped on and this unit is going to come crashing to the ground. I don't think it would absorb a fall, but I have not dropped mine either. I was very careful to gingerly use this. Bottom line is if you need a guitar, bass, vocal or keyboard DI are are on a budget it, this is great. It will get the job done for you without too much noise to boot. It will warm up a brittle sound to an extent but the Behringer is not a miracle worker. This is a little one channel tube preamp made by Behringer. There are no effects other than gain and a built-in limiter. There are a couple other features though. There is a 20dB pad in case you have a very hot signal that is clipping even with the gain all the way down. There is a switch for phantom power for condenser mics. There is a switch for phase reversal if you are doing multi-miking or stereo miking. Then there is a switch to engage the limiter if you want it. The gain is controlled in two stages - a tube gain stage, and then an output stage with another 10db of gain and attenuation down to 0. The connections are XLR mic connectors. It is not rackable, it is a small table-top preamp. It is powered by a 9V wall wart plug. This preamp is very, very easy to use. The controls are very simple so you pretty much just plug it in, decide which features you want engaged, and fiddle with the gains from there. The manual does explain everything it can do, though there is not much documentation necessary because the device is pretty simple. This preamp does color your sound a bit, it's not a very transparent pre-amp. It seems to make things sound a little bit crispier and thinner. It sounds pretty good for electric guitars, but not so good for something that is generally more full featured like lead vocals. Overall I was impressed with its sound considering it's from Behringer, but you definitely don't want to use this on anything with a wide frequency spectrum because this will mess with the sound too much. I used this at a studio about a year ago. I liked what it does to electric guitars, it definitely helped the sound for the track we were recording. It made them more raw and present. I don't like what it does to most other sources, because the coloration usually seems detrimental. I have used a lot of preamps. This one is very cheap, so if you want a starter preamp and you'll be recording a lot of distorted guitars, you may want to consider this one. I wouldn't buy one for my own. What to say? it is anything but professional and not even semi-professional. I'M NOT RECOMMENDED, was not worth more, but rather steer you towards the PRESONUS. BAD REPRODUCION, NO EFFECTIVE CONTROL is pla t.
I tried especially not bought! it is to make a dco bought 10 used. This is BAD made in china. 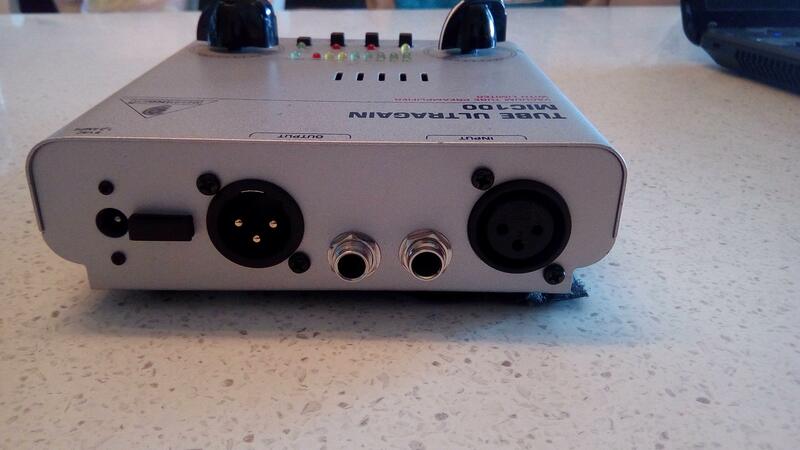 Maltigow's review (This content has been automatically translated from French)" Good cheap solution"
Analog preamp tube (12AX7 low voltage, I doubt very much that it brings), supplied with specific power supply. Mono input jack + XLR outputs for the same. Switches: limiter, attenuator, phantom and reverse phase. I take off a point for the stupid argument "lamp" which seems to me essentially commercial. I found the manual clear, I'm just used to check what he endured as connectivity (both outputs can be used simultaneously, for example) and I quickly found the information I needed. It remains a cheap preamp that goes well beyond, and I am very happy because I did not need more. The sound is ok, and the connection / setting impeccable, so we do what we want, and so far the machine seemed very reliable. Point of his view: Clarity ok, S / N ratio ok, does its job, sturdy, not bulky. My use: Repeats homestudio for microphones (vocals, guitar amp transplanted) or my electro-acoustic. Guitar -> Tonelab Desktop -> MIC100 -> mixing desk and amp XLR jack return. It is a versatile tool, correct, and good to have on hand. I bought used in 2006 or 2007, it has not moved since. Not really ... Apart compared with the MIC200, but I have not seen the interest instrument selector on this unit ... The only preamp enough. I would do this choice without hesitation, as adapted to my needs.